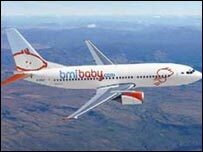 Strike plans by pilots at budget airline Bmibaby have been dropped after their union reached a deal on pay. Union members must now vote on whether to accept the offer, which includes a 2.4% pay rise and guidelines on settling pay from next year. A strike at the carrier would have affected airports including Nottingham East Midlands and Cardiff. Parent company BMI is still in talks with pilots at its regional and long-haul units over a similar dispute. If strikes do go ahead, it could lead to disruption at various UK airports including London's Heathrow, Edinburgh, Manchester and Belfast. "We have held intensive negotiations over the past few days and made substantial progress," said Jim McAuslan general secretary of the British Airline Pilots Association (Balpa). Members of Balpa are angry at changes to pay, working conditions and rotas that they say BMI has imposed without consultation. BMI says it has called for talks.